Michael Baltus family posing in front of their log cabin two miles east of Auburndale Station, Wood County, with a new frame house under construction nearby. 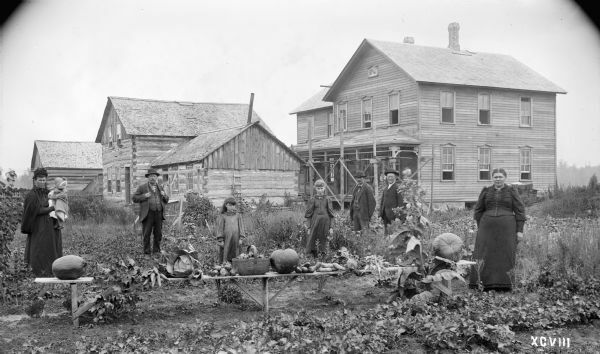 The table in the foreground is displaying vegetables grown on the farm. This image is one of many that was created for and appeared on page 125 in "Northern Wisconsin: A Hand-Book for the Homeseeker" (1896), a promotional survey for the Wisconsin College of Agriculture by W.A. Henry. Henry was the Dean of the College of Agriculture at the University of Wisconsin.